Previous PostYou will love itNext PostLong John Silvers’ fish sandwiches declared the best in show for Fast Food Friday. Get ’em while they’re greasy! I’ve been meaning to try and make this for while, but just haven’t gotten around to it. Maybe this weekend. That pumpkin pi is quite awesome, Amy. As a bonus, it looks like it would be very easy to cut and serve. 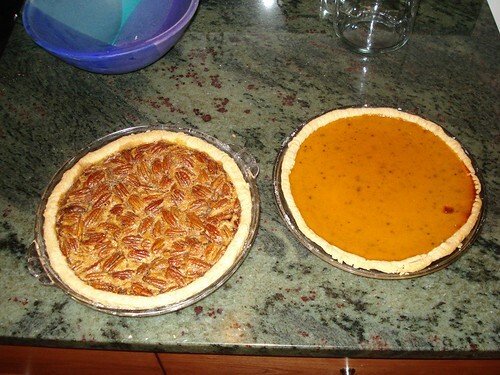 I’ve learned, after years, that it’s important not to overfill the pie shell. I have a pile of custard cups, so if I have too much filling I can make one or two mini, crustless pies. Fill, bake about the same amount of time as the big pie, remove with care, enjoy later at your leisure. Sometimes I even have too much pie dough, and then I can make a tiny pie just for myself. Mini pumpkin pie is an excellent breakfast.